Back on November 2, Vida Blue's Page McConnell sat in with Porter, Batiste and Stoltz at Club Metronome in Burlington for what turned into an epic set of music. On September 30 we'll finally be able to hear what went down at the club when PBS releases MOODOO, an album of ten songs recorded that magical evening. Head over to the MOODOO website to download an mp3 of I Get High from the album. George Porter Jr., Russell Batiste Jr., and Brian Stoltz are part of the rich history that is New Orleans' musical ancestry. 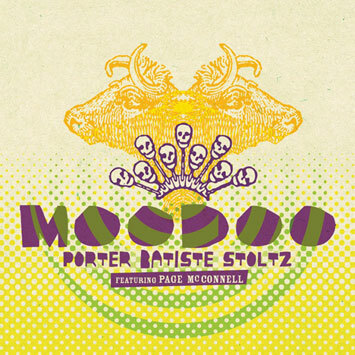 Today, Porter Batiste Stoltz announce the hard hitting trio's first-ever live release MOODOO, featuring special guest keyboardist Page McConnell (Phish) sitting in on select songs. The recording offers highlights from an epic November 2, 2007 gig at Burlington, Vermont's Club Metronome, where McConnell joined PBS on stage for part of their performance. Documentation of the evening has been highly sought after by fan communities, yet there have been no known recordings of the show - until now. MOODOO, which will be available at retail stores and online beginning September 30, documents an evening ripe with musical mojo. What else could happen when New Orleans' funk royalty blends utterly with one of Vermont's finest? Page McConnell and Russell Batiste have a musical history - playing together in Vida Blue, a band that Page formed in 2001. Most recently, Page also performed with PBS at the 2008 New Orleans Jazz & Heritage Festival on the Acura Stage (main). Batiste, accustomed to the more spontaneous approach in the studio, agrees: "To me it's better because we're more unified. The constructions on this album came from jams, right off the top of our heads. Now we're talking grooves!" Stay tuned for information on the next album release by Porter Batiste Stoltz. Few bass players in the history of modern New Orleans music are as storied as George Porter Jr. During the course of a career spanning four decades, Porter has not only made a deep impression with his work in the Meters, but he's notched sessions with artists as diverse as Paul McCartney, Jimmy Buffett, David Byrne, Patti LaBelle, Robbie Robertson and Tori Amos. Early in his career, Porter worked with seminal New Orleans artists like Allen Toussaint, Earl King, Lee Dorsey, and Johnny Adams. Back in 1965, Porter joined on with the Meters, considered by many to be the ultimate fusion of rock, funk and R&B, and gained recognition as one of the scene's elite bass players. Today, Porter features that epic bottom end in his latest collection of Porter Batiste Stoltz tunes. "It's the ultimate jam band," Porter says, "one that actually is more musical than just playing everything you know in every song. This band slaps people in the face until they see how good the stuff is!" As a member of one of N'awlins legendary musical families, Russell Batiste Jr. knows his way around a sound stage. He's played multiple instruments, and has been at the drum kit since the age of four. Even before that, Russell recalls watching his daddy, David Batiste (of the city's seminal funk band David Batiste and the Gladiators), jam with an endless array of the city's most talented musicians. That band hosted a virtual "Who's Who" of '60s musicians. One of Russell's earliest memories is sitting on Jackie Wilson's knee listening to him sing "Lonely Teardrops"! Russell joined the Funky Meters in 1989 and, like Porter, has played with a wide variety of performers, including Harry Connick Jr., Champion Jack DuPree, Robbie Robertson, and Maceo Parker. An industrious artist and creator, the busy Batiste also manages to put time into his own projects, too, like Orkestra from da Hood, who released their debut The Clinic a few years back. "I believe music is in you naturally and you just have to tap into it," he says. "It's got to be an emotional thing. When we play together in Porter Batiste Stoltz, what we do touches all three of us emotionally. That's music to me." Brian Stoltz's playing is a perfect fusion of virtuosity, emotion, and instinct, and the combination has helped him to develop a reputation as one of New Orleans' most sought after guitar players. Stoltz originally made a name for himself with the Neville Brothers, then later the Funky Meters with Batiste and Porter. He's done session work with some of music's best, including Bob Dylan, Paul Simon, Daniel Lanois, Dr. John, Edie Brickell, and Linda Ronstadt. But in addition to his instrumental work, Stoltz has also worked as a singer-songwriter. With the release of his two solo discs, East of Rampart Street and God, Guns & Money—both efforts in the rock and pop vein—Stoltz has added skills as a songwriter, lyricist and melodicist to his repertoire. He even received a Grammy nomination in the Traditional Blues category for a track he contributed to a Mississippi Fred McDowell tribute in 2004. "For a long time I had been stereotyped as a funk guitarist," he says, "But I've always been about songs as opposed to groove or guitar." For Stoltz, PBS is a breathtaking departure from the Funky Meters' routine. Despite its legacy, that band refrained from creating much original material. Porter Batiste Stoltz is diametrically opposite to that; it's a wellspring of spontaneous creativity, a canvas upon which all three of its very talented members can dabble with color. And often those colors combine to create gorgeous pictures. "When we play together, there's one mind at work," says Stoltz. "It's scary sometimes. In the middle of battle, we can be doing some fierce jamming, and George and I will go to the wrong chord together. How does that happen? It only happens when you're of one mind."